Costa Rica is the most popular country in Central America – especially among the tourists from the United States who seem to flood this tiny strip of land in great numbers. For us, as with most of the famous places, Costa Rica set high expectations. And, as in most cases, when the expectations are high, this popular country disappointed us a bit in the end. Crossing the border from Panama, where we experienced the purest paradise islands ever and beautiful architecture in the historical part of Panama City, we felt a little disillusioned at the first glimpse of Costa Rica. The biggest disappointment was related to food prices and the capital – San Jose – which was probably the most disappointing capital we have ever visited. Extremely polluted, messy, even in the very center where we found a few nice buildings. But that’s about it. We’d heard from other travellers that we shouldn’t bother staying in San Jose and just use it as a base for other trips – and I must agree with that! We didn’t see the whole country but the beaches and beach towns we had a chance to visit – at Manuel Antonio National Park and Puerto Viejo did not even come close to the pristine, crystal clear waters of Panama’s islands. The abundance of wild animals, however, was great. Now, it’s enough about complaining. 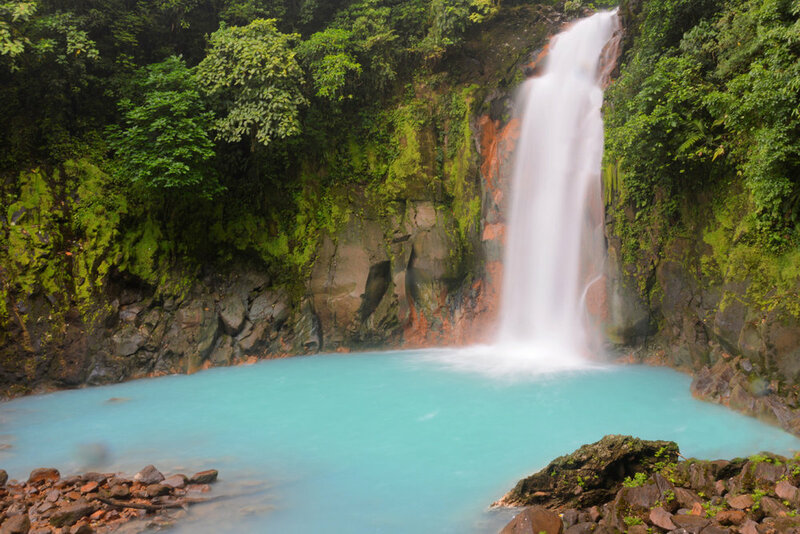 Overall, Costa Rica boasts one of the most beautiful and lush green landscapes in the world. What is more interesting is that the beautiful scenery is dotted here and there with spectacular volcanic peaks – we did some climbing around the village of La Fortuna (which is a gateway also to other amazing places, like the blue river Rio Celeste). The wildlife and richness of rainforests will astound you. That is why I would recommend Costa Rica as an interesting, adventurous destination rather than a beach one – opposite to what it is perceived by an ordinary tourist. I’m not saying that Costa Rica doesn’t have nice beaches but those we’ve seen in the neighbouring Panama are way more beautiful. You must do some climbs around one of the country’s volcanoes – and I would recommend the ones that are more remote (like Arenal near La Fortuna) rather than the Irazu (a day trip from San Jose) which was so disappointing. Although Irazu volcano itself was nothing special, the area around was interesting: with the supposedly haunted Sanatorio Duran and the nearby town of Cartago. You can visit all those places by using a public bus from San Jose. And with extremely high prices in Costa Rica, which are equal or higher to those in Western Europe, I would recommend to take public transport whenever possible. San Jose, Costa Rica City Guide - The Capital with Nothing to See? Before I had a chance to travel to Costa Rica, while having lunch in Panama's paradise San Blas Islands (it's a must! ), we'd met some other amazing backpackers from all over the world who'd done the trip we were going to do the other way around – we were heading from Panama to Costa Rica, they’d just come to Panama from Costa Rica. And all of them shared the same opinion: Costa Rica is a great place to visit with the exception of its capital city: San Jose. Usually, we get quite different impressions from what is generally thought of a place we're visiting, and San Jose, being the central gateway for other destinations in such a popular country as Costa Rica couldn't be so bad after all – we had thought. As it turned out, the opinions were closer to the truth than we had expected. Tropical nature - this is what attracts. Costa Rica, unfortunately, lacks the old, colorful colonial towns like those in Nicaragua, Mexico or Brazil. Therefore, its capital - San Jose, although being the only metropolitan area in the country, is the least visited spot on Costa Rica's tourist map. San Jose is also a jungle, but in a different sense of the word. It's a concrete jungle - and not too pleasant for visitors who are used to beautiful architecture, pristine European old towns or other colonial, vibrant villages. San Jose is also dirty, and I mean, really dirty. The rubbish rot in between the streets, the plastic bags fly grabbed by the wind - pollution is obvious everywhere, even in the very city center. So why on Earth would anyone want to visit this city? Is there really nothing that it can offer?